The Ukrainian historian Volodomyr Vyatrovich has raised the status of the ethnic conflict between Ukrainians and Poles, more precisely between the Polish Home Army and the Ukrainian Rebel Army, during and after World War II, to a war. On 14 October, the unofficial Day of the Ukrainian Insurgent Army (UPA), nationalists from Oleh Tyahnybok’s party came out once more on to the streets of Kyiv. Vyatrovich and Tyahnybok are united in their desire to achieve recognition for the UPA as a participant in WWII. For the moment, their battle has been without much success. The chief problem besetting the procedure for raising the role of the UPA to nationwide Ukrainian status is not only the lack of national consensus (the UPA was mainly active in Western Ukraine: its veterans living there now have all the relevant privileges, though only within the region), but the international situation too. If Kyiv officially recognises the UPA – and Viktor Yushchenko made a feeble attempt to do just this at the end of his term in office in January 2010 – there will be protests from at least three capitals: Moscow, Tel Aviv and Warsaw. Volhynia, the region in the northwest corner of Ukraine on Poland's western border, was the scene of a cruel ethnic conflict between Ukrainians and the Poles during WWII. 60,000 Poles lost their lives at the hands of Ukrainian nationalists and Polish resistance fighters killed 15,000 Ukrainians. Moscow’s viewpoint is understandable. The Ukrainian Insurgent Army was fighting for Ukrainian independence from the USSR: the NKVD had to allocate considerable forces to deal with it and hundreds of Ukrainian villages were deported to Siberia in totality. The Jewish community considers that, as the UPA was initially made up mainly of Ukrainian polizei who had fled into the forest and are additionally tainted by having cooperated with the Germans in the destruction of the Jews, the subsequent treatment by UPA members of the Jews was hardly likely to be fair. The Poles cannot forgive the UPA for what in Polish is called ‘rzeź wołyńska’ or the Volhynia Massacre. On which subject – Western Volhynia, which today lies within the Volhynia, Rivne region and the north of the Ternopol regions of Ukraine, came under Polish rule after 150 years as part of the Russian Empire. It had no Catholics, either Greek or Roman. In 1939, after 20 years under Polish rule, Poles made up approximately 16% of the population. Part of them were settlers from the central districts of Poland, who had received large plots of land, to the dissatisfaction of the poor Ukrainian majority. Stalin and Hitler had divided up Poland and then started fighting each other. Each side had its own plans for the future of the region. The Ukrainians thought Western Ukraine should be the stronghold of the new Ukrainian state. The Poles considered it their duty to get the region back within Polish borders. Stalin was against both ideas and would not countenance Volyhynia (and Western Galicia) not being part of the USSR. To return to the borders of 1939 he had to prove to the West that there were no Poles in the region, which was why he could only rejoice when ethnic conflict flared up in Volhynia. Some sources even refer to provocations by Soviet partisans, which could have incited the massacre. But the main reason for the anti-Polish flare up in Volhynia was the ethnic cleansing of Poles carried out by the local UPA leadership headed by Dmytro Klyachkivsky. The Red Army was advancing and it was necessary to be sure Poland could have no claims on these lands. Naturally, the local Poles set up vigilante defence units. The conflict spread to other districts. In the years 1942-47 about 60,000 Poles and 15,000 Ukrainians are thought to have perished on the Ukraine-Polish border. The rest was achieved by the so-called ‘population exchange’ (1944-46), when 750,000 Poles were moved from Ukraine to Poland and 488,000 Ukrainians from Poland to Ukraine. The current border runs through the middle of a two monoethnic communities. After Volodymyr Vyatrovich was retired as director of the National Security Service Archive (formerly KGB), he disappeared from view, reappearing only in the context of the persecution of the historians from the Lviv National Museum ‘Prison on Lonsky St.’ The persecution was chiefly connected with Vyatrovich’s Centre for Research into the Liberation Movement, the name given to the battle between the Organisation of Ukrainian Nationalists (OUN) and the UPA for Ukrainian independence during WWII. Vyatrovich was actually on sabbatical at Harvard, from which he had recently returned. Now there is a new excuse to talk about the historian, whom some would like to see as head of the Institute of National Memory of Ukraine, though others consider his views less than impartial. 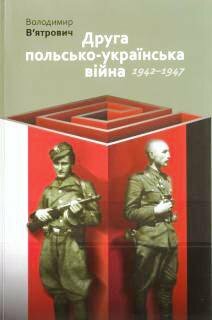 Vyatrovich has published a book 'The 2nd Polish-Ukrainian War, 1942-47 in OUN and URA documents.' As the historian himself pointed out at the presentation in the Kyiv-Mohyla Academy, the idea of writing the book came to him when he was preparing to publish historical documents from KGB files, which had been put in the public domain, and from the personal archive of one of the OUN leaders, Mykola Lebed, part of which is in Harvard and part in Lviv. So it's quite difficult to establish what is an addendum to what. What, however, is important is Vyatrovich's initially succesful intellectual provocation. The stakes were raised when the book was published by one of Ukraine's best universities – the Kyiv-Mohyla Academy; the launch was chaired by its president, Serhii Kvit. The new term 'war' to describe the Polish-Ukrainian confrontation was revealed to society on the eve of the unoffical UPA Day, 14 October, which coincides with the religious feast of the Intercession of the Mother of God. The word 'war' had already given rise to a first outburst of indignation in Polish right-wing conservative circles, who were determined that their tried and tested term 'ludobójstwo’ (effectively genocide) should not be replaced by the nobler ‘war’, if the Ukrainians and the Poles accepted it, of course. In Poland it is still considered that one should have no truck with thugs: decades of communism drummed into Polish heads that what the UPA was trying to do was to wrest from Poland lands which had been settled by Ukrainians from the south-east of the country. At the same time, after 1990 it became possible to speak of the tragedy of the Polish population in Volhynia. In communist times the subject of Polish-Ukrainian relations in the recent past was taboo. After the collapse of communism historians in both countries engaged in a tough discussion of their nations' historical experience, but finding a mutually accepted truth turned out to be very difficult. A recent controversial book by historian Volodymyr Vyatrovich's shows why. Vyatrovich had one more reason for pursuing his intellectual disagreement with the Poles: internal Ukrainian reaction to the defence of the UPA (if the protest in Poland were to be well publicised in Ukraine). This would facilitate the process of achieving countrywide recognition, which Ukrainian National Democrats failed to pull off in 20 years. Incidentally, some hotheads (often election rivals of the Party of the Regions) have spoken of the cooling off between Moscow and Yanukovych as an opportunity for making a ‘true’ Ukrainian of him, even possibly turning him into a defender of the nationalist view of history. For the moment the real situation looks somewhat different: the Ukrainian Ministry of Education, paradoxically, is in the hands of the Ukrainophobe Dmitry Tabachnik. Why do I say that Vyatrovich’s intellectual provocation was initially successful? Because announcing a new historical concept is much easier than defending it. And Volodymyr Vyatrovich is bound to have problems with that. For the Polish and the Ukrainian underground to be described as combatants of equal stature the Ukrainian state has to recognise the repeal of President Yushchenko’s decree as unlawful (obviously the fact that historical arguments are decided by presidential decree is quite odd, but in post-Soviet Ukraine it’s what happens). It means that Yanykovych himself would have to give his support to this point of view. There has to be academic, as well as political, compromise. And that’s not so simple. It’s not only Polish and other Western researchers who may not agree with Vyatrovich, but many Ukrainian academics too. One of them, Ihor Ilyushin, was the first to speak at the presentation of the book. In his opinion the author has made too little use of Western archival sources. He also commented on the presentation of the main theme – the Volyhynian Tragedy - criticising Vyatrovich’s assertion of ‘symmetry’ between the combatants as facile. What Vyatrovich wanted to do, as he said himself, was to ‘dissolve’ the Volhynian Tragedy in other regions, dates and events. He explained that during this time there was a military standoff in Eastern Galicia too, as well as beyond the Curzon line, in the lands settled by Ukrainians in south-east Poland. It all began with the murders of individual members of the Ukrainian intelligentsia in the Chelm Lands [Pol. Ziemia Chelmska]. Although calling this 'war' is rather stretching a point, Vyatrovich is consciously trying to expand the time frame of the conflict – not just before the bloodiest year, 1943, but after it, right up until 1947. This is significant, because in 1947 a campaign called 'Visla' aimed finally to clear the Ukrainians from Polish lands along the USSR border, although, as the Polish historian Grzegorz Motyka has said, by that time the UPA already represented no threat at all in Poland. Vyatrovich has also tried to question the numbers of Polish victims at Volhynia: his thesis is that the figure of 100 Polish villages immolated in the night of 11/12 June 1943 has to be an exaggeration. These unsubtle approaches only distract attention from Volhynia as the central theme of the conflict. In all fairness it should be stressed that Vyatrovich recognises mistakes, which could be classified as war crimes, were made on BOTH SIDES during the war. To dot the 'i's and cross the 't's, Ukraine needs a multi-level balanced historical discussion. Simplification and hasty conclusions are unacceptable. A vivid example of this approach to historical proof was the exhibition 'The massacre at Volhynia: Polish and Jewish victims of OUN and UPA', which Vadim Kolesnichenko, Rada deputy and representative of the Yanukovych Party of the Regions, brought from Poland last year. At the presentation in the Kyiv-Mohlyla Academy Vakhtang Kipiani, chief editor of the website 'Historical Truth', described Vyatrovich as one of the historians with whom one can and should engage. The discussion with him would have to include such questions as: was there a real war between the Poles and the Ukrainians, how much truth was there in this war (the Soviet, and now the Russian and German, interpretations should at the very least be remembered). And are historians researching these questions entitled to be so subjective in their defence of national interests as to leave themselves the possibility of preserving their reputations as impartial and significant historians.